Skin lightening creams typically include multiple ingredients that are trying to lower the amount of melanine in your skin, but mostly on the area where you’re applying the cream. Some products may be based on retinoic acid or steroids in order to be efficient, whereas some are all natural. Their formula works as it includes arbuint and kojic acid, natural components that lighten skin. 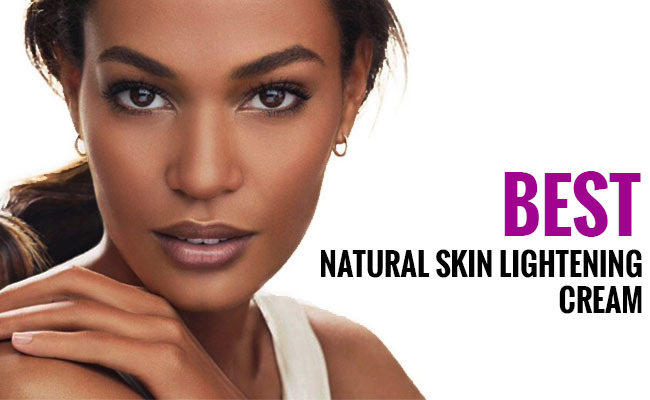 What makes a natural skin lightening cream good? Many are trying to go the easy and chemical way, using the hydroquinone based lightening creams. Sure enough, hydroquinone works but it does stir some controversy worldwide (still), which means you should always observe some safety measures when using it. Luckily for all of us, the natural skin lightening creams work just as well and in some cases even better. You always need to check the list of ingredients as some may bring out some allergies, if you’re an allergic customer. Skin reacts differently so you need to watch your skin on how it reacts to a skin lightening cream. Most natural choices out there are safe for all skin types, but this doesn’t mean you shouldn’t stop the second you notice a side effect. The list of natural ingredients that work for removing dark spots, age spots or other hyperpigmentation is long and you only need to be patient and watch carefully your skin. Inflammation and redness are always a bad sign and you should stop the second you notice them on your skin. There are plenty of natural skin lightening creams that give great results. Hydroquinone isn’t the only ingredient that lightens skin. You just need to be patient and careful, no matter which way you go in the end. 1). 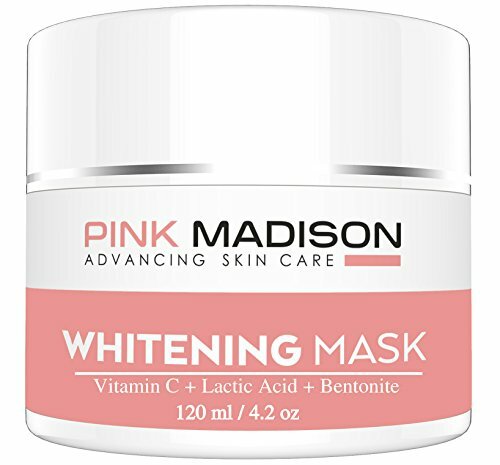 If you’re trying to understand what makes the Pink Madison Skin Lightening Cream with Kojic Acid Vitamin C Hyaluronic Acid work, you need to take a look at its ingredients. The cream is a safe choice for all skin types as its ingredients are natural, but able to get you rid of dark spots on various parts of your body. Here’s what you’re going to read on the list of ingredients: Vitamin B1, B2, B5, B6, B12, but also bearberry extract, licorice, Kojic Acid, root extract and green tea extract. Coenzyme Q10 and hyaluronic acid are also among the ingredients, thus explaining why the cream works for whitening your skin. The cream has a subtle, yet pretty scent that doesn’t linger for long time. A little goes a long way and the cream doesn’t stain your clothes. Able to also moisturize your skin, the cream may give results after a couple of weeks. Lightweight and evening your skin tone, the cream fades the dark spots, but you need some patience until you notice the results. As long as you’re focusing on the good parts and see the downsides as inherent and minor, you’re not ending up with a lemon when getting the cream, for sure. 2). 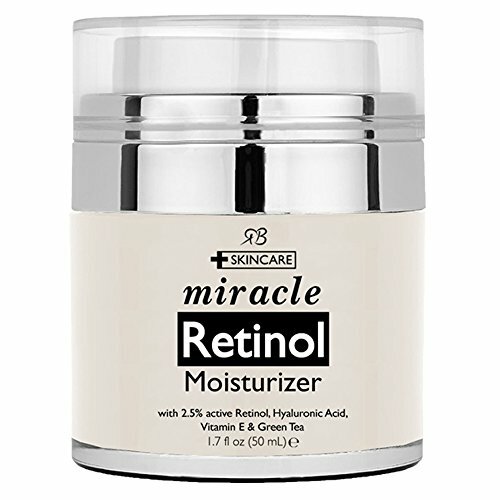 Even though it’s not especially made for whitening the skin, the combination of ingredients of the Retinol Moisturizer Cream for Face is going to bring many benefits to your skin, whitening including. The cream includes 2.5% active Retinol, but also hyaluronic Acid, Green Tea and vitamin E. they all work for minimizing the appearance of wrinkles, while also brightening your skin tone. The cream addresses the hyperpigmentation, removing dark spots, age spots and other skin issues. The formula is safe to use by all skin types. It clears up your skin, leaving it softer and brighter. You can wear it under your make-up, but you should always use sun protection while using the cream. A little goes a long way and you may benefit from the cream for a good amount of time. It doesn’t clog your pores and hydrates your skin. It doesn’t give skin irritation either. The dispenser makes the cream very easy to use. Its lightweight consistency helps get nice and easy into your skin. The cream doesn’t contain any fillers, harmful fragrances, parabens or dyes. It’s a cruelty free and vegan option and this may seal the deal for the environment fan. However, as you’re not only whitening your skin, but also keep the aging signs at distance, the cream is a great choice anytime. 3). Designed to efficiently remove dark/age spots, the Botanic Hearth Skin Whitening and Brightening Serum is a natural option that is well priced and is worth to try. The cream’s formula removes freckles, acne scars, sun spots, and age spot. It gives a nice glow to your skin and also evens the skin tone. The lightweight texture of the cream makes it easy to go into your skin. A little goes a long way so the cream is going to serve you well for a good amount of time. The smell is nice and the serum moisturizes your skin. In order to stay on the safe side, it’s better to do a patch test before applying it on your face. The ingredients increase collagen production, moisturizing your skin. You’re going to feel your skin softer and more hydrated too. The serum is botanical so it has never been tested on animals. It’s a safe product for pregnant women too. You may use it daily, before applying your moisturizer. Only afterwards you should put your make-up on. However, for the good price and natural formula, the serum is a valid choice for many. 4). Pamper yourself with a natural skin cream like the SkinBright Skin Brightener | Best Natural Melasma Treatment and Age Spot Remover. The cream helps you get rid of freckles, acne marks or dark spots, on various parts of your body: face, hands or body. The ingredients used on the cream are high quality which makes it safe to use by all skin types and shades, men or women. Its formula minimizes the appearance of skin discolorations and evens your skin tone too. Surprisingly, the cream also works against the fine lines and wrinkles too. The main ingredients of the cream are the high levels of Alpha-Arbutin and Kojic Acid, that protect your skin, while exfoliating it and lowering the melanin production. 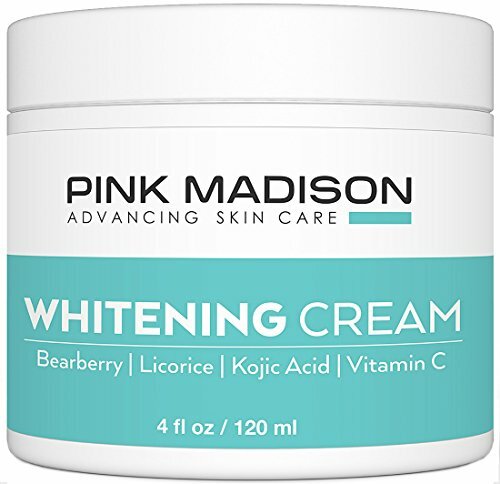 The Allantoin and Vitamin A inside the cream has anti-aging abilities so this is why the cream removes also the fine lines and wrinkles from aging. The cream has a nice smell and a lightweight consistency. It goes easy and fast into your skin and the pump dispenser isn’t just hygienic, but it’s also easy to use. The cream doesn’t leave any heavy or greasy feel on the skin and may give results even after 3 weeks of usage. Efficient, natural and made in our USA, the cream is one natural choice you shouldn’t miss on. As long as you keep in mind that all skin is different, you should see the cream as a natural skin lightening option that works for so many. 5). The more you’re willing to pay for your skin lightening cream, the more you should expect from it when it comes to its performances. 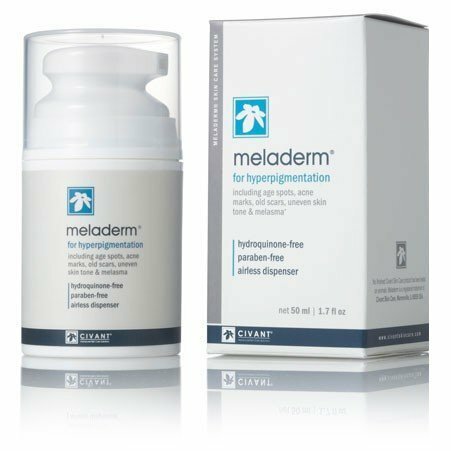 Even though it’s not quite the cheapest option out there (truth be told, it’s quite far from that), the Meladerm 1.7 oz. Skin Lightening / Whitening Cream for Hyperpigmentation, Dark Spots, Scars, Discolorations, Uneven Skin Tone is going to impress many with its results. Don’t think that the high price makes the cream less popular, as it doesn’t. Quite the opposite, the cream is well-known and popular due to its efficiency (read our full review). The formula is based on 10 ingredients that work for removing the dark spots or various hyperpigmentation issues. It lightens your skin, no matter the skin type you’re having. The cream addresses to various skin hyperpigmentation issues, from dark spots to melasma or age spots. On the list of ingredients, you’re going to notice: Niacin amide, bearberry, mulberry, licorice, kojic acid, citric acid and many more. Each of these ingredients are known for their whitening abilities, so it’s only natural that a combination of all is going to give impressive results. You’re not going to find on the list of ingredients hydroquinone, which makes the cream more valuable and a reliable natural option. The cream doesn’t include mercury or other bleaching substances either. The lightweight texture of the cream makes it go easy and smooth into the skin. Not only the cream lightens your skin, but it keeps it well moisturized too. Due to its light consistency, the cream doesn’t leave a greasy feel on your skin. It has no specific scent and you only need a little bit each time. The cream is made in our USA and it’s a no.1 choice for many professionals. It goes without saying that, for the great results and strong formula, the cream is good investment to make for the whitening of your skin. There are many natural options for the black skin when it comes to solving the hyperpigmentation problems, but we decided to go with the SKIN LIGHTENING Whitening Cream Mask. Use as Dark Spot Corrector to Brighten Dark Skin for several reasons. Not only the cream’s formula includes only natural ingredients, but it also works against the first signs of aging, which are all trying to fight against sooner or later. The cream contains high-quality plant-bases extracts, natural clays and Vitamin C. we also find on that list vitamin B3, niacin amide, lactic acids, magnesium and other plant extracts and oils. No less than 70% of the cream is made in fact with natural ingredients. Jojoba seed oil, morus alba root extract, papaya extract and bentonite clay add up on the list. Your skin gets softer and whitens as you use the cream. Some even got results after a couple of days of use. Age spots, wrinkles, fine lines and dark spots under eye circles fade away as you’re using the cream. The formula of the cream is safe for all skin types, even sensitive and combination skin. The scent is a tad fruity, but in a nice way. The cream has a rich, thick texture that goes smooth into your skin. The cream is made fresh and brightens skin, as various as it may be. Natural, efficient and reliable for all skin types, the cream works and is great for the black skin.